Are You Smarter than a Student at St. Mary’s Institute? St. Mary’s Institute was an SSND school of higher learning for young women. It established by Mother Caroline Friess in 1851 and was located at the Notre Dame Motherhouse in Milwaukee, Wisconsin. 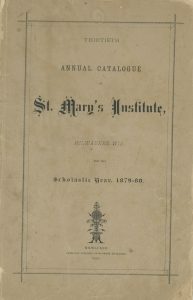 Each year, the school published a catalog that included information about the school (cost, course of studies, required text books, fees, etc. ), a list of students and graduates and the program for the closing exercises. 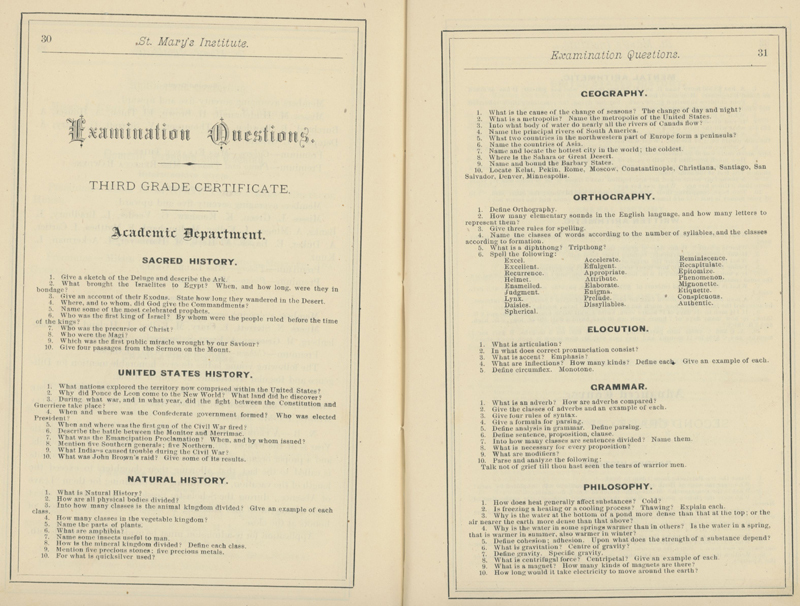 The catalog for 1879-1880 is interesting because it also included a list of exam questions from the various departments. The girls were tested on a wide range of subjects, including some that would be familiar to most of us: history, grammar, geography, arithmetic and chemistry. Other subjects, however, might not be as recognizable. For example, the girls were given questions on orthography, elocution and etymology. Orthography: How many elementary sounds in the English language, and how many letters to represent them? Grammar: Give a formula for parsing. Higher Arithmetic: Give the four kinds of policies issued by a life insurance company? Natural History: Into how many classes is the animal kingdom divided. Give an example of each class. Geography: Name and bound the Barbary States.